A major factor behind the weak recovery and gloomy outlook is a climate of policy-induced economic uncertainty. 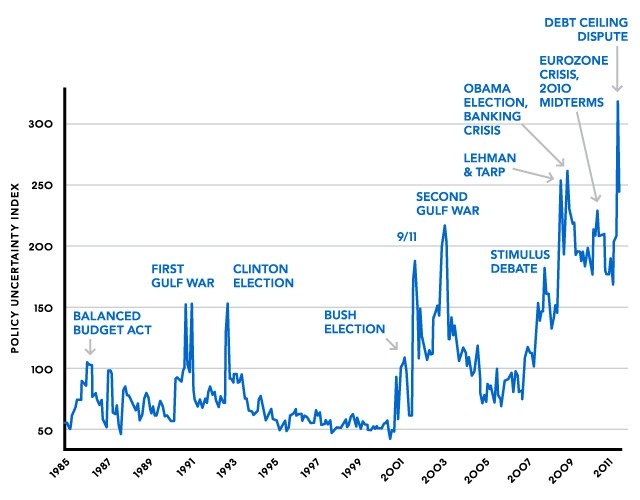 An index we devised [chart below] shows U.S. policy uncertainty at historically high levels…. Our index shows prominent surges in policy uncertainty around the time of major elections, the outbreak of wars and after the Sept. 11 attacks. It shows another surge after the bankruptcy of Lehman Brothers Holding Inc. in September 2008. Policy uncertainty has remained at high levels ever since…. 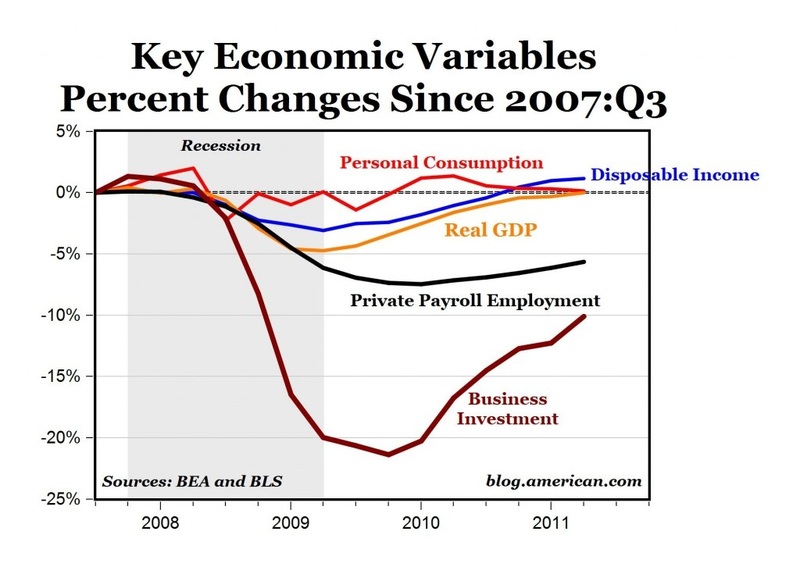 Source: Mark J. Perry, “The Jobless Recovery Is Really an Investment-less Recovery,” The Enterprise Blog, October 3, 2011. • The most volatile component of G.D.P. over the business cycle is spending on investment goods. This spending category includes equipment, software, inventory accumulation, and residential and nonresidential construction. And the recent economic downturn offers this case in point about the problem: From the economy’s peak in the fourth quarter of 2007 to the recession’s official end, G.D.P. fell by only 5.1 percent, while investment spending fell by a whopping 34 percent…. Myriad government actions influence the expected future profitability of capital. These include not only policies concerning taxation but also those concerning trade and regulation. the economy remained in the depression as late as 1940 because private investment had never recovered sufficiently after its collapse during the Great Contraction [of 1929-33]…. By way of closing the circle, I note that Higgs endorses Baker, Bloom, and Davis’s research. It is more than evident that the only sure route to economic recovery is the replacement of Obama by a Republican (almost any one will do), and firm Republican control of both houses of Congress. This entry was posted in Economics: Principles and Issues and tagged Great Recession, recovery, regime uncertainty. Bookmark the permalink.